Media clamour on issues relating to crime, justice and civil liberties has never been more insistent. Whether it is the murder of James Bulger or detaining terrorist suspects for long periods without trial, mediated comment has grown immeasurably over the last twenty years. So, how does it interact with and shape policy in these fields? How do the politicians both respond to and try to manipulate the media which permeates our society and culture? Bolstered by content and framing analysis, it argues that, especially, in the last decade, fear of media criticism and the Daily Mail effect has restricted the policymaking agenda in crime and justice, concluding that the expanding influence of the Internet and Web 2.0 has begun to undermine some of the ways in which agencies such as the police have gained and held a presentational advantage. Written by a former BBC Home Affairs Correspondent, with unrivalled access to the highest reaches of policy-making, it is both academically rigorous and accessible and will be of interest to both scholars and practitioners in media and criminal justice. 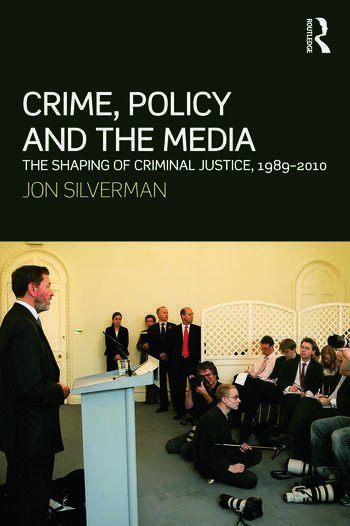 Jon Silverman has been Professor of Media and Criminal Justice at the University of Bedfordshire since July 2007. He is a leading criminal justice analyst and authority on international war crimes tribunals and from 1989-2002, was the BBC Home Affairs Correspondent. His earlier BBC career included a spell in Paris as a correspondent (1987-89) and at Westminster as a political correspondent. In 1996, he won the Sony Radio Gold Award for his reporting of war crimes issues on Radio 4.